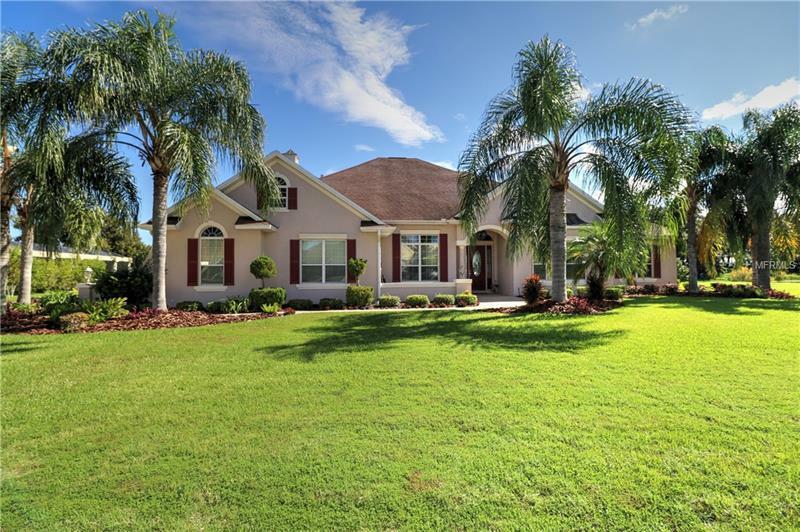 OUTSTANDING VIEWS OF LAKE SUMTER for PRIVACY, WILDLIFE activity and it's LOCATION and all amenities this PREMIER home has to offer. EAST FACING LANAI allows you to enjoy beautiful morning sunrises from the Lanai. A water feature with falls adds to the enhanced landscaping package. PRIVACY and SPECTACULAR VIEWS enhance the BIRDCAGE with a HEATED POOL and HOT TUB. OUTDOOR KITCHEN with built in gas grill. The DOUBLE GARAGE and GOLF CART GARAGE are SIDE FACING. The OVERSIZED LOT allows for future expansion. This SANIBEL PREMIER HOME has Granite counter tops and Cherry cabinets in the kitchen. Guest half bath off the kitchen. BRIDGEPORT AT LAKE SUMTER is conveniently located to the adjacent Arnold Palmer Country Club and the Lake Sumter square. PRIVACY, POSITION, POSSIBILITIES are at this beautiful home. Furniture and accessories are available separately. PLEASE WATCH OUR VIDEO OF THIS UNIQUE HOME WITH A VIEW THAT CAN'T BE DUPLICATED.